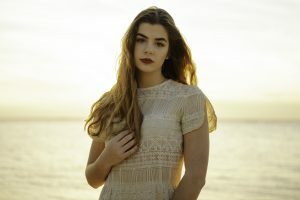 Grace Marie Russell is a 17-year-old singer-songwriter from Mandeville, Louisiana with over 30 original songs under her belt. She began her music journey playing the piano at age of 7 that quickly grew into songwriting at the tender age of 9. Described as a sensitive old soul, Grace writes in great depth well beyond her years. Writing has always been a creative outlet for her to release everything inside. When words alone can’t seem to describe what she is feeling, music is her go-to. Her music is heartfelt and gut wrenching at times, and often leaves listeners wondering where the inspiration comes from. Her happy place is sitting in front of the piano which is her oldest and most trusted confidant; truly a best friend. Writing music is a large piece of her identity; a piece of her heart and soul to share with all. Grace is a lead singer in the St. Timothy’s Methodist Church Praise Band, which allows her to combine her two loves: worship and music. Grace is a student of Tipitina’s Internship Program (TIP) as well as the New Orleans Heritage School of Music by the New Orleans Jazz and Heritage Foundation. She has been a student in St. Tammany Parish School’s talented music program for the last 8 years and studies piano and guitar. Grace will continue to pursue her dreams through a songwriting career. Grace believes that music truly is healing for the soul and can help mend hearts. Her dream is for her music to help people and bring them together. We invite you to enjoy a few of Grace’s songs by visiting her Spotify page at Grace Russell.